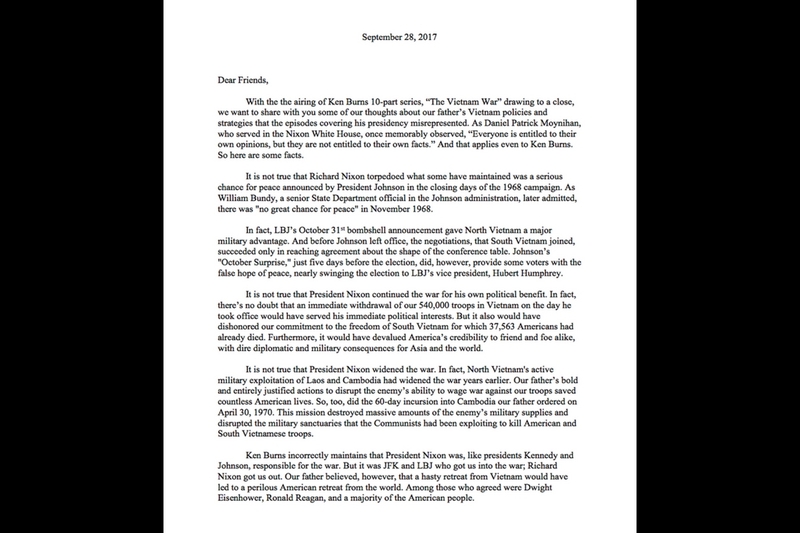 With the the airing of Ken Burns’ 10-part series, “The Vietnam War” drawing to a close, we want to share with you some of our thoughts about our father’s Vietnam policies and strategies that the episodes covering his presidency misrepresented. As Daniel Patrick Moynihan, who served in the Nixon White House, once memorably observed, “Everyone is entitled to their own opinions, but they are not entitled to their own facts.” And that applies even to Ken Burns. So here are some facts. It is not true that Richard Nixon torpedoed what some have maintained was a serious chance for peace announced by President Johnson in the closing days of the 1968 campaign. As William Bundy, a senior State Department official in the Johnson administration, later admitted, there was “no great chance for peace” in November 1968. In fact, LBJ’s October 31st bombshell announcement gave North Vietnam a major military advantage. And before Johnson left office, the negotiations, that South Vietnam joined, succeeded only in reaching agreement about the shape of the conference table. Johnson’s “October Surprise,” just five days before the election, did, however, provide some voters with the false hope of peace, nearly swinging the election to LBJ’s vice president, Hubert Humphrey. It is not true that President Nixon continued the war for his own political benefit. In fact, there’s no doubt that an immediate withdrawal of our 540,000 troops in Vietnam on the day he took office would have served his immediate political interests. But it also would have dishonored our commitment to the freedom of South Vietnam for which 37,563 Americans had already died. Furthermore, it would have devalued America’s credibility to friend and foe alike, with dire diplomatic and military consequences for Asia and the world. It is not true that President Nixon widened the war. In fact, North Vietnam’s active military exploitation of Laos and Cambodia had widened the war years earlier. Our father’s bold and entirely justified actions to disrupt the enemy’s ability to wage war against our troops saved countless American lives. So, too, did the 60-day incursion into Cambodia our father ordered on April 30, 1970. This mission destroyed massive amounts of the enemy’s military supplies and disrupted the military sanctuaries that the Communists had been exploiting to kill American and South Vietnamese troops. Ken Burns incorrectly maintains that President Nixon was, like presidents Kennedy and Johnson, responsible for the war. But it was JFK and LBJ who got us into the war; Richard Nixon got us out. Our father believed, however, that a hasty retreat from Vietnam would have led to a perilous American retreat from the world. Among those who agreed were Dwight Eisenhower, Ronald Reagan, and a majority of the American people. In 12 televised “Addresses to the Nation” on Vietnam in his first term, Richard Nixon explained to the American people his plan for ending the war. He won the support of the “Silent Majority” of Americans; did what he said he would do; and never lost their support for his policy. The Nixon “Vietnamization” strategy gave South Vietnam a chance to defend itself against Soviet and Chinese-backed Communist aggression. It also confirmed America’s bipartisan commitment, dating to the Truman administration, to resist Communist expansionism. His willingness to take strong action affirmed that America would keep its word, making possible his historic opening to China and ultimately leading to the collapse of the Soviet Union. Our father agonized over the war-driven divisions in our country. He understood that the anti-war passions were rooted in frustration with the war’s duration. But he also knew that their dissent made his goal of a lasting peace more difficult to achieve. It saddened him that so many clashed in America’s streets and on college campuses, and it angered him that some treated our troops returning home from the battlefield as pariahs. President Nixon wound down America’s involvement in Vietnam to give the people of South Vietnam the chance to live in freedom. To suggest that he strung out the war is flatly wrong. To say that the reason for the war was wrong disparages the honorable service of those who fought in Vietnam, America’s most difficult war. And each of these false contentions dismisses the will of the American people, who re-elected our father with an historic 49-state majority over an opponent who vehemently opposed our father’s Vietnam strategy. In 1973, as America’s role in the war ended and our prisoners of war came home, Richard Nixon’s vision of a wider, transformative peace was taking hold, a peace that ensured a generation of peace for the American people even as the world’s political order underwent enormous change. These are the facts. Perhaps if Ken Burns had himself visited the Nixon Library he might have learned the real history of Vietnam during the Nixon years. Unfortunately, he did not. Fortunately, however, the tens of thousands who come to Yorba Linda – or follow the Richard Nixon Foundation on the web or through social media – will find that the truth resides there for all to see and learn from. And for that fact we are grateful to all those who support the Richard Nixon Foundation in its mission to promote the legacy of our father, the 37th President of the United States.